Still a few minutes before the start of the Twin 150s, so what should we be looking for here Thursday afternoon? TV, TV, TV, it's all about TV these days in this sport. 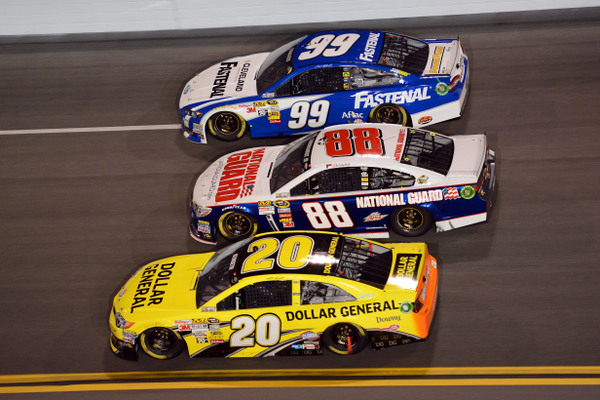 So what to make of Saturday night's TV ratings for the stock car racing season kickoff sprint, the Sprint Unlimited shootout? Down 18 percent from last season's shootout, in the nation's top markets? Remember that ratings for last fall's championship playoffs were flat or down for all 10 chase races, and the title finale was down a whopping 25 percent. All that may be one reason Daytona is moving the Twin 150s from Thursday afternoon to Thursday evening next season. There is a lot going on behind closed doors in the NASCAR TV world at the moment, with Fox expanding later this year to a more all-sports approach with its cable channel allocation currently held by Speed. That's going to become FoxSports1, whatever that will look like. Speed apparently goes away, as Fox cranks up to battle sports giant ESPN/Disney. Think Speed becomes FoxSports1 August 1, but not sure what that really means. TV production of NASCAR events sometimes leaves a lot to be desired. And the broadcasters in the booth may be getting a bit tired, a bit long in the tooth. Now, how many miles of NASCAR racing are run while the network is in commercial break? Makes Bruton Smith's pitch for TV-timeouts appear eminently logical. Here's another question: how is NASCAR TV going to handle these new 2013s, the technical questions surrounding the new machines? So far, not so well. How about some wind tunnel air smoke rolling over the 2013s and compared to the 2012s, to show fans just what the differences are? Maybe some video clips of Harry Gant's four-in-a-row streak back in 1991, with that then-trick 'cambered' rear-end that no one else knew about for while. The cambered rear-end is sudden back in the rule book this season, and it will be interesting at Phoenix and Las Vegas to see if pit crews try -- as they did in the old days -- grease up that 'bent' axle on pit stops. Remember Martinsville Speedway 1992 -- when the cambered rear-ends were suddenly the rage....and broke like pretzels, with teams pushing the envelope? Yet now comes word that ESPN has dropped its rolling tech center, the one filled with all the parts and pieces and cutaway race cars, for 30-second drop-ins. It was dropped last season, and ESPN executives have apparently nixed a proposal to bring it back. Now maybe the bit pieces from the tech center were jammed into the broadcasts in a rather haphazard manner at times, and the whole project could have been produced better. But dropping a TV tech operation as extensive as that, during the year of the 2013s, and all the technical changes, well, to be blunt that is just dumb. If anything Fox and ESPN ought to be teaming up on the tech side, and amping up the whole game. 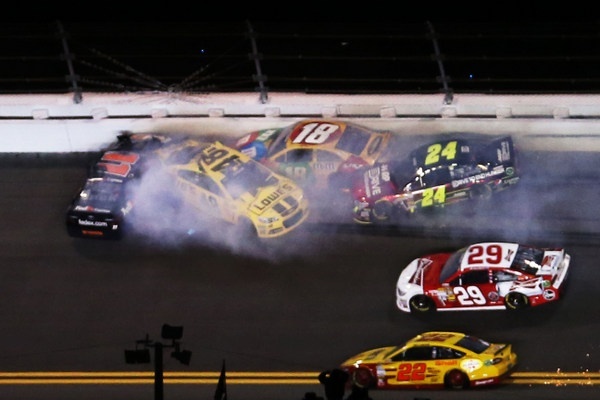 Drivers are crashing right and left in these new cars, and how is TV handling the questions? Not very well so far. As SpeedWeeks goes on, this track is becoming hotter and slicker, with more rubber and grease laid down. No rain, and none in the forecast. Temps could hit 86 sometime this week, and in the 70s for the 500. 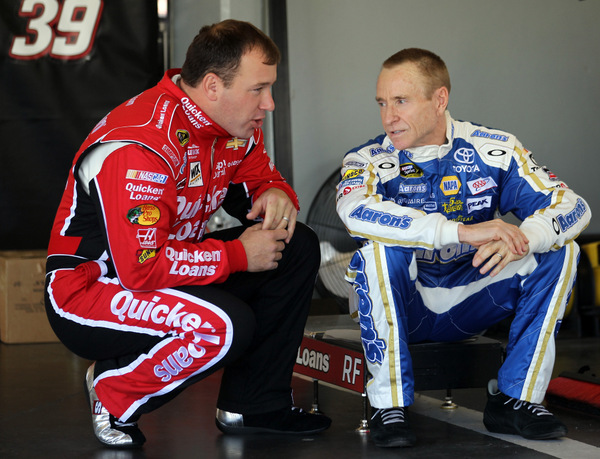 Consider the Ryan Newman-Carl Edwards spin. The rear spoilers on these cars this SpeedWeeks are about half as tall as last year's race cars. That's a lot of rear downforce lost. Some 450 pounds. That's maybe 25 percent off the entire car. And the aerodynamics of the side-draft appear considerably different now. Drivers use the side-draft (pulling up along side the other guy) to slow him down. But what is happening is that takes more air off the rear spoiler and makes the car suddenly much looser. How about some better visuals on TV? For example, who loses more air, the guy coming up on the inside, or the guy stuck on the outside? The new rear spoilers here (and this whole discussion is only applicable to Daytona) may provide more speed, because of less drag. But downforce is drag, and a look at the qualifying speeds may provide a better indication of who has what here -- fast, like Danica Patrick and Jeff Gordon, means they're running with less downforce. On the other hand, Jimmie Johnson and Kevin Harvick, also in Chevys, for example, were much slower -- and some observers say that's because they want more drag/downforce in their cars, so they will handle better in the pack. And consider how smoothly Harvick handled Greg Biffle the final mile Saturday night. When Biffle moved to pass on the high side, Harvick moved up to block...and Harvick kept Biffle glued right to his bumper the rest of the way -- no way that Biffle could make a dive to the inside. The long-standing rule for a plate race is never, never lift off the gas, no matter what. That means drivers here are using the brakes instead. Trail-braking, to be keep the RPMs up, to keep momentum. And those rotors are glowing. Whether or not that will melt tires' sealing beads remains to be seen. NASCAR's thinking is apparently that this new aero package here will string out the cars into smaller packs over a long run. Another factor to consider: the sea breeze. There's a reason the Daytona Beach airport runways are laid out east-to-west. And the backstretch of this track is parallel. A 20 mph wind can add 300 rpm or subtract 300 rpm. Submitted by GinaV24 on Fri 02/22/2013 - 07:27. Ha, you were expecting better coverage for NASCAR on TV? Wow, you are much more hopeful than I am. I have no expectations that as a fan and a viewer I will get anything other than blather and drivel from the booth. Once upon a time (as most fairy tales begin), Fox did a great job with its coverage. It was interesting, balanced and informative. That lasted until the first contract renewal when Fox became the "cult of personality" and the Waltrip brothers became the focus. I'm not really interested in what either of them have to say, I'd like to hear Mike Joy call the race, but that no longer happens and I seldom watch. I have a computer, I use trackpass (when it's working) and the radio feed to follow the action. Wonder why no one is watching? Well, NASCAR did it's darndest for years to court the "casual fan" and didn't worry about whether or not the "diehard" fans were satisfied. They finally got what they wanted - the majority of fans are now "casual" and that translates into lower ratings and attendance. Submitted by Glenn Parks on Sun 02/24/2013 - 13:31. Can someone tell me which network is showing the Daytona 500? I tuned into Fox but they are running the \"Commercial 500\" instead. This may be the NASCAR superbowl, but unlike the football superbowl where the non fan at the party wants to see the new made for superbowl ads, thats not the case here. Why are ratings down? Maybe when number of commercials shown exceeds laps shown, there are just better ways to spend our time. Submitted by Rog Verhaar on Fri 02/22/2013 - 08:00. Submitted by cecil inman on Fri 02/22/2013 - 14:18. What really gets me! I bet if you added all the commercials up that Na$car has more commercials of themselves than all the rest put together. So what is up with that. What is really bad they are the same ones all the time. And if a team gets a good sponsor you can look for Na$car to send them a letter that they can be the official whatever for a large sum of money and then they drop the team. Greed! Submitted by Michael in SoCal on Mon 02/25/2013 - 09:24. Cecil Inman has a great point - how many of the endless commercials are for Nascar itself? Aren't they preaching to the choir at that point? And why on earth do they show Nascar commercials instead of showing green flag racing? Or have lovely segue shots of the racetrack (but not racing) while there is green flag racing going on? I think a few heads need to roll in the Nascar / Fox production department.